What Does It Mean to Find Your Calling? 1st and 2nd-year college students ask: What program do I major in? 3rd and 4th-year college students ask: What type of job do I pursue? College alums ask: Am I in the right job? The right career? For many people the question ultimately becomes: Am I called to do something? What am I called to do? The answers aren’t clear. And the questions don’t end. They don’t end because many times our jobs, careers, and lives don’t jive with our deepest beliefs and values, or God’s Word. You might say, at an archetypal level, we always feel a bit lost because we were created to work and we can’t find work that completely fulfills us; in short, we are looking for a way back to Eden — where we live in perfection relationship with God, humanity, and creation. The truth is that we won’t find it in this world, but in the next. So our quest in faith continues. It has to. We are wired to seek God’s blessing. It is our journey of faith. The Gospel of Matthew calls us to be blessed. What does that mean? It means to be pure of heart. It boggles the mind to think it is a blessing to be pure of heart. To be pure of heart seems so boring. It doesn’t seem like living that way would be any fun. But that is our good culture perverted by sin making us feel that way, not the Word of the Gospel. So what does being holistically counter-cultural mean for our daily lives? Gordon Smith also tells us that in addition to being called to believe, we are called to a mission and to immediate responsibilities. In other words, I believe that when we choose to accept God’s Word we choose to strive to be pure of heart. To be pure of heart means we accept an invitation to follow Jesus, seek our purpose in life (vocation), and perform our day-to-day work (occupation), forever trying to integrate our occupation with our vocation, which is the key to spiritual growth and happiness. So choosing to follow Jesus is a fundamental, critical decision. Following that, a fundamental critical decision is discovering our mission, purpose, vocation. These days, when we hear the word calling, we hear it in the context of our job. Or, it refers only to the ministry. Both interpretations are extreme. Our calling is not our occupation, and it is not narrowly limited to working for a church; our mission is bigger than any job. Our occupation may be only a means to an end; or, it may be more. But more than likely we have a greater purpose, a more holy purpose. Even though we can argue that work is part of God’s good creation (Adam and Eve worked in the Garden before the Fall), our work life, the economy, etc. are also part of the fallen world. Our calling may be more pure, yet never (in this life anyway) practiced with moral perfection and purity of heart. An analogy may be helpful. In our job, we tend to seek upward mobility. That is the way of the world. But Jesus calls us to downward mobility — to be a servant of all, a Good Samaritan. To get a job and career, we tend to advertise our “resume virtues.” We emphasize what we did according to an economic model. Yet when we die, people remember us for our “eulogy virtues,” for who we were according to a moral model. To put it another way, Adam I is the Adam of occupation. Adam II is the Adam of calling. The culture of occupation tends to be one of scarcity and upward mobility; the culture of vocation tends to be one of abundance and downward mobility. “Adam I — the creating, building, and discovering Adam — lives by a straightforward utilitarian logic. It’s the logic of economics. Input leads to output. Effort leads to reward. Practice makes perfect. Pursue self-interest. Maximize your utility. Impress the world….To nurture you Adam I career, it makes sense to cultivate your strengths. Adam II lives by an inverse logic. It’s a moral logic, not an economic one. You have to give to receive. You have to surrender to something outside yourself to gain strength within yourself. …In order to fulfill yourself, you have to forget yourself. In order to find yourself, you have to lose yourself….To nurture you Adam II moral core, it is necessary to confront your weaknesses” (David Brooks, The Road to Character, p. xii). In addition to equating our job to our occupation, we may have accepted other myths about calling. Calling (vocation) is not something we find alone. God blesses us through other people. Calling requires accountability and feedback from our community. This reflects or primary, general calling; Elizabeth Newman writes that our primary calling “is to be a people who live in communion with our triune God” (“Called Through Relationship” in Kruschwitz, Vocation: Christian Reflection). Calling (vocation) is not something we choose. What we choose is whether to accept it. Calling starts with listening, listening to what grieves us. To be called requires hearing. For example, “Moses did not invent or determine his vocation, he receives it from God….’Vocation’ differs from ‘career’ in this regard; while ‘career’ (related to a Medieval Latin word for ‘race track’) refers primarily to human effort (as in ‘What do you do for a living?’), vocation points in another direction. The initiative resides not with us, but with the One who calls and invites” (Newman, ibid). Calling (vocation) is more than “finding our talents and figuring out what to do with them. Rather and more fully, it is discovering and living out of the infinite and gratuitous abundance of God” (Newman, ibid). Think of Moses: sometimes our calling may not match up with our talents. Calling (vocation) is more than meeting market needs in a profitable way; calling pulls us into unprofitable situations. Vocations are revealed through grieving about the market’s shortcomings. Bill Hybels writes that calling begins with experiencing “holy discontent.” What in the world we grieve about is something God places on our heart. For example, does economic injustice make you sad? Does racism? Segregation? Sexism? Poverty? Lack of childcare in your church or community? Lack of care or concern for the elderly? Lack of care and concern for the marginalized? The people in prison? Lack of good educational options? Food deserts? The inability to share information among friends and family? Cancer? Alcoholism? The parts of the world’s brokenness that make you sad are those parts that are worth paying attention to. God takes the initiative. “[Calling] is not generated from within a person but from the outside, and the outside comprises not merely our parents and our society, but God….All calling is based on the reality of a God who takes initiative, who seeks to include human beings in his grand project of transforming everything” (p. 111). We are called to be others-focused. “We are called to a way of life…as other-oriented values and goals as the primary source of motivation. The calling is to life — relationships, civic responsibilities, church membership, family, neighboring and work — not just to work….we are called not only to invent, innovate and accomplish, but to do this in a particular way, the way of faith, hope and love, the way of justice, compassion and self-control” (pp. 111, 112). We are called to be purpose-driven. “Calling…directs people to approach a particular life role (e.g. work) in a manner oriented toward demonstrating or deriving a sense of purpose or meaningfulness….The English Puritans brilliantly distinguished between the ‘general’ calling, by which people are summoned into a relationship with God to become children of God, and the ‘particular’ calling, by which people are guided into particular occupations, such as magistrate, homemaker, pastor or merchant” (p. 112). We are called to a contribute to a Grand Purpose, to be part of the Grand Narrative. “Life and work are not merely for our own advancement, not even simply to provide for our families, but we are caught up in a grand purpose, in the grand story of God’s plan for creation and people. The entire notion of calling is rooted in the meta-narrative of the Christian faith and subsumed by it” (p. 113). Thus, “‘Calling is a transcendent summons, experienced as originating beyond the self, to approach a particular life role (e.g., work) in a manner oriented toward demonstrating or deriving a sense of purpose or meaningfulness, and that which holds other-oriented values and goals as primary sources of motivation'” (Philip Wu, as quoted in Entrepreneurial Leadership, pp. 109, 110). The Grand Narrative? Creation, Fall, Redemption. So if we believe God has given us a purpose for our lives as a way to bless us and call us to purity of heart, how do we discern that purpose? Goosen and Stephens give us some advice in the form of self-reflection questions. What are our gifts and talents? What are we naturally good at doing? Where might there be an overlap between our skills and opportunities (to serve others and make a living) and our deepest motivations? “God calls us by equipping us to serve in a specific way” (p. 121). However, “God does not have a wonderful plan for our lives as is often proposed….God has something better than a wonderful plan: a wonderful purpose. A plan is terrifying, especially if we make a mistake in reading the directions. A purpose is evocative. A purpose is like a fast-moving stream that carries us along and allows for some mobility from side to side…” (p. 119). What is our unique personality? There are many accessible tools to assess this and coaches to help us interpret the results. I have found Myers-Briggs and free on-line knockoffs (“16 Personalities”) to be helpful. Also, I have found Peter Drucker’s class article “Managing Oneself” to be valuable. What providential circumstances have led us to this point? It turns out that where we were born and the family we were born into and the one we created are important, as are the messy things in life we experienced. Henri Nouwen wrote a great book, Wounded Healers, to make the point that Christ was wounded to heal us. We too have experienced wounds which help us understand the circumstances of others. Parker Palmer also speaks best to this point. He says, “Let your life speak.” We don’t make the call. We listen to what God is already doing in our lives. Calling is something we see by looking in the rear-view mirror. What is God saying about our purpose? Some people hear from God directly. Most of us don’t. “Some locutions or words come from without; they are corporeal and are heard in the ear even if no one else is able to witness the sound. Some come from the inmost parts of the soul. They are imaginary, though not in the sense of fabricated. They are not heard in the ear but experienced as an impression received by an imaginary faculty. And some locutions are intellectual and spiritual as God imprints a message in the depth of the person’s spirit and understanding” (p. 124). Where do those questions overlap for you? What program do I major in? What type of job do I pursue? The question is What am I called to do? Or, better, the question is will I accept God’s calling to believe and then choose serve God and love my neighbor? And then, How? That evolving how can be a guiding policy for your life. Your major, job, and career will then take care of themselves. The tension will then be in trying to integrate the your calling (vocation) and occupation together. There will be tension between your vocation and occupation. Christians live in two kingdoms: the kingdom of God and the kingdom of humanity. God is forever sovereign but those kingdoms won’t perfectly overlap until Christ returns. Elizabeth Newman outlines some spiritual practices to facilitate the discovery of our calling (vocation). Prayer: “the practice of prayer helps us resist the idea, so common in our culture, that waiting is of little use….The rich kind of waiting we practice in prayer trains us to be patient with ourselves, others, and even God” (Newman, ibid). Patience, prayer, and reflection, so counter-cultural to the culture of occupation, are a critical part of the discerning process. “My Lord God, I have no idea where I am going. I do not see the road ahead of me. I cannot know for certain where it will end. Nor do I really know myself, and the fact that I think I am following your will does not mean that I am actually doing so. But I believe that the desire to please you does in fact please you. And I hope I have that desire in all that I am doing. I hope that I will never do anything apart from that desire in all that I am doing. And I know that if I do this you will lead me by the right road though I may know nothing about it. Therefore will I trust you always though I may seem to be lost and in the shadow of death. I will not fear, for you are ever with me and you will never leave me to face my perils alone” (Thomas Merton, as quoted in Entrepreneurial Leadership, p. 125). Lord, help us listen and may our major, job/career, life, and calling/purpose significantly and holistically overlap so that we may experience the blessing of purity of heart. This article first appear on LinkedIn. Innovation: “the ability to do something new, unique and different and to satisfy a need in the marketplace. While an inventor comes up with ideas, an innovator delivers market-oriented products and services. The role of the entrepreneur is then the pursuit of innovation in the marketplace” (pp. 23, 24). Seizing Opportunities: “Entrepreneurs recognize, seize and pursue opportunities to innovate in the marketplace. They see change as normal and healthy….An entrepreneur is one who creates a new venture and gathers the necessary resources to pursue the opportunity” (p. 25). Gaining personal satisfaction through innovation: “In short, entrepreneurs must have a clear sense of fulfillment and satisfaction in their work. They will not succeed if they do not like what they are doing but are in it only for the money” (pp. 25, 26). Doing Risk Analysis: “An entrepreneur must have the discipline to conduct sufficient due diligence before committing resources to the undertaking” (p. 26). 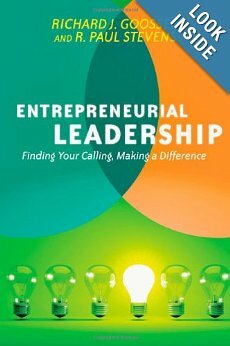 Developing Entrepreneurial Habits: “According to Stephen Spinelli and Jeffrey Timmons, there are six dominant themes that have emerged from what successful entrepreneurs do and how they perform: Commitment and determination, Leadership, Opportunity obsession, Tolerance of risk, Tolerance of ambiguity and uncertainty, Creativity, self-reliance and adaptability, Motivation to excel (p. 27). “[Without] leadership, great ideas never become embodied. But at the same time, people that are gifted in coordinating work and workers–managers–also may not be entrepreneurs as they do not bring to their leadership innovation, seizing opportunities and creating” (p. 27). Leadership: “a relationship of influence in which follower-ship is gained and goals are met” (p. 29). Good leaders cultivate the culture of a community or organization. It turns out that the culture (identified by artifacts and symbols, values that are cherished, and fundamental beliefs) speaks more loudly than the leader…. [The] leader is in a sense an environmental engineer, reinforcing values, providing symbols and artifacts that visualize those values, and seeing that the fundamental beliefs of the organization are right and appropriated” (p. 30). Good leaders cast a vision for the community or organization (p. 30). Good leaders implement a process by which follower-ship is gained and goals are attained….It is process of recognizing the input, concerns and passions that God has given members of a group, along with other leaders in the same community, and working with this….And the leader can only lead the process if he or she actually joins the community (or system)” (p. 30). Good leaders implement fairness and justice (p. 31). Good leaders exercise stewardship of the gifts and talents of others….This is called ‘equipping’ in the Bible…” (p. 31). Good leaders make followers into leaders. “[Everyone] is fitted by God to have a sphere of influence, great or small, and thus every person is a leader in some sense” (pp. 31, 32). “The role of leadership is evident in the Genesis narrative of creation when Adam was called to name the animals, and Adam and Eve were called to fill the earth….Second, leadership is one of the gifts of the Spirit mentioned in the Pauline letters (Rom 12:8). This means that over and above any natural leadership capacity, which to a larger or lesser extent all have, some people receive an anointing that moves their natural and creational abilities a notch further” (p. 32). “Our concept of entrepreneurial leadership is based on the potent combination of what constitutes a great leader and what the entrepreneur brings to that leadership. Entrepreneurs must view themselves more deliberately as leaders and realize that they have great ability to influence others. Likewise, leaders benefit by expanding their influence through their capacity to pursue innovation” (p. 40). “Worldview is the story about everything that gives us meaning and helps us make sense of life….For the Christian, this worldview is rooted in the story of the Bible….It is the grand narrative of God’s determination to bring his life-bringing rule into all creation and all people, concluding in the transformation of everything into a new heaven and a new earth….Because the biblical story is the grand narrative of who we are, who God is and what it all means, it is a story that catches up our life callings and enfold them in a grander narrative” (p. 49). “God has made creatures that are capable of humanizing the earth, and in the process become more human themselves. That means that both God and human beings are in charge of the world. They are partners, but not equal partners. Men and women are stewards entrusted with creation but accountable to the Creator. Human activity is expected and critical, but it is not absolute. In the end, and there will be an end, the conclusion of all is not a technical paradise or a dreary end in a fizzle or a bang, but the glorious second coming of Christ and the renewal of everything (Rev 21:5). This empowers, but does not make absolute, human activity. As individuals we are not extinguished, reincarnated or merely join the spirits of our ancestors. We are resurrected to a grand rendezvous with our Creator and Redeemer in a completely renewed creation where we will enjoy ongoing creativity (Rev 21:24). We will be more human than we could be in this life” (pp. 54, 55). “[A] biblical worldview suggests that work undertaken with faith, hope and love will last, and purged of sin will find its place in the new heaven and new earth” (p. 60). “In the beginning God created….And God said, ‘Let us make man in our image, after our likeness’….So God created man in his own image, in the image of God created he him; male and female created he them. And God blessed them, and God said unto them, ‘Be fruitful, and multiply, and replenish the earth, and subdue it: and have dominion over the fish of the sea, and over the fowl of the air, and over every living thing that moveth upon the earth’” (Genesis 1:1,26,27,28). God created all work to matter, but without God work is meaningless. “‘What do people get for all the toil and anxious striving with which they labor under the sun?….People can do no better than to eat and drink and find satisfaction in their toil. This too, I see, is from the hand of God’ (Ecles 2:22, 24)…. [The Professor in Ecclesiastes] is convinced that it is God’s will for work to be useless! And God speaking through this Professor asks us to reflect on our experience of work because he wants to call us to faith in a God who has determined that work should be useless….If work, even volunteer work in Christian service, proves to be meaningless, then we are invited to conclude that we were not made for work but for God. If the Professor is right, then we will not find satisfaction in our work through faith in God…. ; instead, we will find satisfaction in our God through our experience of work….His holy doubt gives us opportunity to find in God what we cannot find in work under the sun. Work is an evangelist to take us to Christ” (pp. 79, 80). We were created in God’s image to be co-creators with God. “Two things distinguish human beings from other animals. First, we are made as relational beings — male and female — in resemblance of the relational God who dwells as a being in communion — Father, Son and Spirit. [Second, we] are like God in that we are made to work, to invent, to care for creation and to develop the potential of the created order” (p. 82). We were created to work in community. “We are most godlike in relationships. Persons are not the same as individuals. We are persons not in our individual life by in relationship to God and other people” (p. 68). Work is worship. “‘All spirituality springs from this fundamental fact of a God who love us first…If Christian spirituality is, before all else, an initiative by and a gift from God who loved us and seeks us, spirituality is then our recognition and response, with all that entails, to this love of God that desires to humanize and sanctify us. This path to spirituality is a process, concrete but never finished, by which we identify ourselves with God’s plan for creation. Because this plan is essentially the Kingdom of God and its justice (holiness), spirituality is identification with the will of God for bringing this Kingdom to us and others’ (Segundo Galilea, as quoted in Entrepreneurial Leadership)…. [Spirituality] is not cultivating extra-ordinary experiences but rather the infiltration of ordinary life with kingdom justice and holiness….The spirit is simply one dimension of personhood in a totally integrated personhood that is expressed in bodily activity, emotional life and intellectual thought (soul)….In biblical anthropology we do not have a body or soul or spirit; we are a body, a soul, a spirit” (pp. 64, 68). Thus…“[We] go to work as a whole person — not just mind or body, but all that inner yearning and expressiveness that links us God…. [As] soul persons with capacity to relate to God, we are given ideas, visions, and perspectives that can be implemented through entrepreneurial activity…. [Our] actual experiences in envisioning, inventing and implementing as entrepreneurs are an arena for spiritual growth….The workplace presents most people with the greatest opportunity for spiritual growth…. [Christian] spirituality and its recognition of a soul dimension to human life and work means that personal growth is not a human achievement (through disciplines and practices) but a response to the Spirit’s initiative” (pp., 68, 69). We are called to work: As Christians, we seek to worship God by co-creating work experiences in the marketplace that matter. This, too, is part of our Christian spirituality. “[The marketplace] is the place where we get revealed as persons. Our inside is revealed by what we do outside, by the way we work, by our relationships with people, by the realities of how we go about doing day to day enterprise…. [The] seven deadly sins, soul-sapping struggles that include pride, greed, lust, anger, envy, sloth, and gluttony, are revealed not in quiet times and prayer retreats but in the thick of life, in business meetings, as we struggle over this month’s sales, when we have to deal with an awkward [situation with a] customer or employee. And every soul-sapping struggle becomes an opportunity to grow spiritually….The work we do, if it is good work, is some part of God’s own work of creating, sustaining, transforming or consummating….We are actually partners with God in our daily work….It means that instead of regarding work in the world as a diversion from the spiritual life and from the ‘work of the Lord’…, we are doing ‘the Lord’s work’ in creating new products and services, developing the organizational culture of our business, engaging in trading and global enrichment, creating new wealth and improving human life…. [We] must practice the ‘mixed life’…. [both] working [and] communing with Jesus” (pp. 70, 71). What Does it Mean to be Called to Work? Belonging to God. “[Calling] is not generated from within a person but from the outside, and the outside comprises not merely our parents and our society, but God….All calling is based on the reality of a God who takes initiative, who seeks to include human beings in his grand project of transforming everything” (p. 111). Being Godlike people in behavior. “We are called to a way of life…as other-oriented values and goals as the primary source of motivation. The calling is to life — relationships, civic responsibilities, church membership, family, neighboring and work — not just to work….we are called not only to invent, innovate and accomplish, but to do this in a particular way, the way of faith, hope and love, the way of justice, compassion and self-control” (pp. 111, 112). Doing God’s work in the world. “Calling…directs people to approach a particular life role (e.g. work) in a manner oriented toward demonstrating or deriving a sense of purpose or meaningfulness….The English Puritans brilliantly distinguished between the ‘general’ calling, by which people are summoned into a relationship with God to become children of God, and the ‘particular’ calling, by which people are guided into particular occupations, such as magistrate, homemaker, pastor or merchant” (p. 112). Experiencing life purpose. “Life and work are not merely for our own advancement, not even simply to provide for our families, but we are caught up in a grand purpose, in the grand story of God’s plan for creation and people. The entire notion of calling is rooted in the metanarrative of the Christian faith and subsumed by it” (p. 113).